A field of flowers as a tribute to the siege victims. 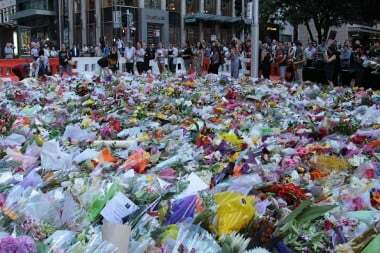 A field of flowers has taken over Martin Place reflecting the grief, anguish and also the unity that the events of Monday night have had on the city of Sydney. The city – which one man tried to divide and destroy – has come together to mourn. By 10pm last night a queue of people stood waiting to show their respect. One of those who lay flowers at the makeshift memorial was the Australian Grant Mufti, Professor Ibrahim Abu Mohammed “Today we are here, all of us, Australians grieving our great loss,” a spokesman for the Mufti, Sheikh Aref Chaker told News Limited. “We will be standing united and strong with our fellow citizens and we will not allow anyone to rob us of our values of tolerance and peace. 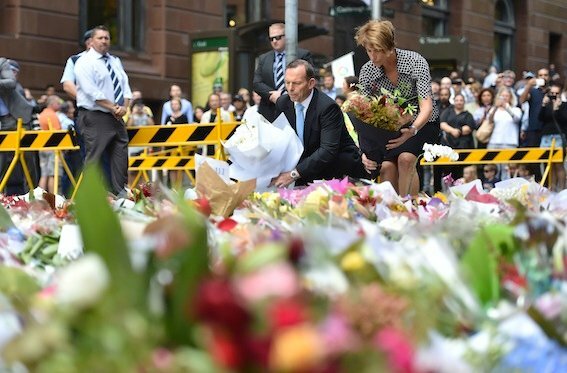 Late yesterday the Prime Minister Tony Abbott and his wife Margie spent their moment in reflection. Not speaking to anyone they laid flowers and moved on. Prime Minister Tony Abbott has revealed the gunman responsible for the Sydney siege was not on a security watchlist, despite his long criminal history and known “infatuation with extremism”. Self-styled Iranian cleric Man Haron Monis was killed about 16 hours after taking 17 people hostage at the Lindt Chocolate Cafe on Monday morning. Two hostages, Lindt cafe manager Tori Johnson, 34, and barrister Katrina Dawson, 38, were also killed. Mr Abbott flew to Sydney on Tuesday afternoon after convening a meeting of the powerful National Security Committee of Cabinet Tuesday morning. Standing alongside New South Wales Premier Mike Baird and Australian Federal Police Commissioner Andrew Colvin, Mr Abbott described Monis as a “deeply disturbed individual” who was “consistently weird”. “How can someone who has had such a long and chequered history, not be on the appropriate watchlists?” he said. “And how can someone like that be entirely at large in the community? Mr Abbott said the man was well known to the NSW Police, the AFP and the domestic spy agency ASIO and said it was reasonable to ask whether the incident could have been prevented. “Even if this individual, this sick and disturbed individual, had been front and centre on our watchlists, even if this individual had been monitored 24 hours a day, it’s quite likely, certainly possible, that this incident could have taken place, because the level of control that would be necessary to prevent people from going about their daily life, would be very, very high indeed,” he said. Mr Baird echoed Mr Abbott’s comments. “We are all outraged that this guy was on the street. We are. And we need to understand why he was,” he said. “We also need to understand why he wasn’t picked up and we’ll be working closely with the Federal authorities together with our own agencies to ensure what we can do better. 3. Why was Man Haron Monis out on bail? The overwhelming questions being asked about Man Haron Monis now is why was he out on bail? The ABC reports that Monis would have already been in custody if the Government’s changes to the Bail Act were in place. New South Wales Attorney-General Brad Hazzard told the ABC that if tough changes to the New South Wales Bail Act were in force that would not have happened. “This government changed the Bail Act to ensure greater safety for our community,” he said. “It was changed to ensure that offenders involved in serious crime will not get bail. That’s our intent. For more read this ABC post here. For Nina Funnell on the questions that should be asked about bail laws read this post here. 4. Why didn’t police give in to his demands? 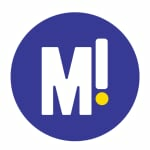 News Limited ask the question why police did not give in to Man Haron Moni’s demands, which on the face of it seemed to be relatively simple. Queensland barrister Patrick Van Grinsven, who spent 21 years with the police and 12 years of them as a counter-terrorism-qualified specialist negotiator told News Limited that the three requests could have had horrific consequences. “If he got the ISIS flag, he could use that to make a very dramatic statement indeed,” he said. If he got the phone call with the Prime Minister it would have set a dangerous precedent. “Governments around the world would not consider that.” He said. There were concerns he could have executed a hostage as a dramatic statement. And if the media publicized his demands that Australia was under attack from ISIS it would have set up an international stage. In the wake of the siege in Martin Place NSW Police have re-activated a Sydney-wide, high visibility operation named Operation Hammerhead. Police announced yesterday that the operation will be conducted over the next three weeks focusing on high-visibility policing, increased presence in public places and public transport hubs. 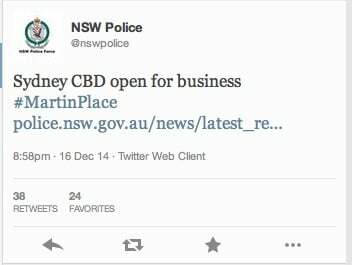 NSW Police have confirmed that Sydney is open for business and they have urged members of the public to conduct business as usual today. All roads are expected to be open by 10am. Police have said they will continue to maintain a crime scene perimeter around the cafe at the corner of Martin Place and Philip Street, however this will not impede on any other business. Six Taliban gunmen have bombed and shot to death 132 children in a Pakistan school. An unknown number of survivors are being treated in hospitals as frantic parents search for news of their children. The BBC reports that the attack is the deadliest ever by the Taliban in Pakistan. Scenes of chaos have been broadcast around the world as bodies have been carried out of hospitals in coffins. 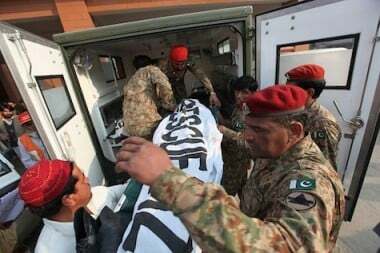 The attack took place in north-west Pakistan when about half a dozen gunmen entering the school in the hours of yesterday morning and began shooting at random. The military arrived shortly after and exchanged fire with the Taliban. Students wearing their green school uniforms could be seen on Pakistani television, fleeing the area. Armoured personnel carriers were deployed around the school grounds. Hours later Pakistani military said all six of the Taliban militants were dead. Most of the dead were between 12 and 16 years old reports CNN. After a day of fierce winds and temps the Victorian town of West Wodonga has seen its fire threat ease with the CFA saying it is comfortable that houses will not be affected by the blaze. In Victoria there are over 200 fires burning with four main trouble spots in and around Lake Rowan, Kyneton, Benalla and Longwood East, south of Euroa. The CFA issued emergency warnings for several communities in north-eastern Victoria. For the latest in Victoria visit the CFA incident page. For the latest in South Australia visit the CFS page. A high school student whose story went viral after he told a US magazine that he made $72 million during his school lunch breaks has now admitted he lied. The story, which went viral around the world, featured tales of BMWs and swish New York apartments. Weight gain after pregnancy study. A study has shown many of us what we already knew – the year after having a baby is bloody hard work. This particular study on weight gain has shown that 75% of Mums are heavier a year after giving birth than they were before they became pregnant. The research out of the University of Chicago and Houston Methodist Hospital analyzed date in the US from low-income women and found that one-third of those who were normal weight before pregnancy became overweight or obese one year after childbirth. Top 10 reasons for divorce. A study has shown the top ten reasons married couples get don’t get divorced when they want to, and the answers are kinda depressing. The Mirror reports that 1 in 5 plan on staying together over the Christmas period, but ending the marriage in January. Of those who are now divorced, one in four stayed in the relationship longer than they wanted to for the children. According to the reports the top ten reasons for staying together were. This year’s Apple Christmas ad is making tears fall right around the world. It has been viewed on YouTube over 1.8 million times. Despite what many think of Apple the 90-second commercial called ‘The Song’ will warm even the hardest of hearts. 13. PM confirms Man Haron Monis had a gun licence. Prime Minister Tony Abbott confirmed Man Haron Monis had a legal gun licence despite his prior convictions. Mr Abbott detailed how concerning it was that he slipped through the system. 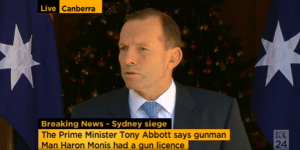 “We do need to know what this individual was doing with a gun licence, “ said Abbott in a press conference today. 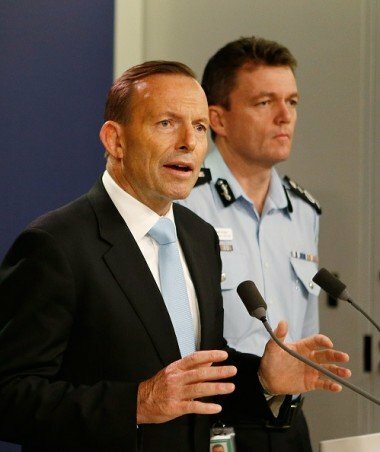 Tony Abbott and NSW Premier Mike Baird have launched an urgent review into the Sydney siege. Since this post was updated, the Prime Minister’s Press Office released the above statement. Ongoing investigations are still occurring, looking into whether Man Monis had a legal gun license. 14. Tori Johnson and Katrina Dawson were executed by Man Haron Monis. The ongoing police investigation and post mortars on both victims reveals that it was shots fired by Man Haron Monis that killed the innocent hostages. Mr Johnson was believed to have been executed by Monis after being shot in the head with the shotgun. Ms Dawson had also suffered a shot gun blast to her body. She later died in hospital. While still in its infancy it appears the two had already been hit with shot gun blasts before police shot Monis multiple times.